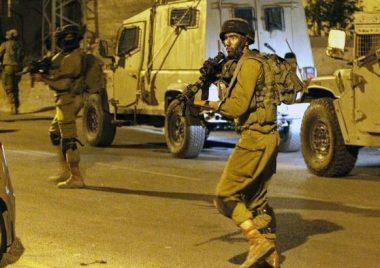 Israeli soldiers abducted, Sunday, at least seven Palestinians in several parts of the occupied West Bank, including Jerusalem, after the soldiers invaded and searched many homes. The Palestinian Prisoners’ Society (PPS) has reported that dozens of soldiers invaded the northern West Bank city of Nablus, and nearby communities, and abducted Yacoub al-‘Aassi. It is worth mentioning that Ya’coub in the brother of Abdul-Hakim, who is wanted by the military allegedly for killing an Israeli colonialist settler, identified as Raziel Shevach, 35, from Gilad illegal outpost, near Nablus. Furthermore, the soldiers abducted Ahmad ‘Atef Raja from his home in Aqbat Jabr refugee camp, in Jericho. The soldiers also invaded and searched homes in Hizma town, near Jerusalem, and abducted Bashar Suleiman and Mahmoud Talal Jouda. In al-‘Isawiya town, in Jerusalem, the soldiers also searched many homes and abducted Mahmoud Fayez Mahmoud, 40, and Mohammad Ibrahim Mustafa, 44, in addition to summoning Shadi Moheisin for interrogation.